In a gaming world that seems to be becoming increasingly over-saturated with sequels and where new IP’s seem to fall by the wayside, Arkane Studios 2012 action-adventure stealth game Dishonored was all the more impressive. In fact, it was by far my favorite game last year. For those who haven’t played through the main game, Dishonored follows Corvo Attano, a legendary bodyguard for Dunwall’s famed Empress Jessamine Kaldwin. After being framed for her murder and the kidnap of her daughter (and heir to the throne) Emily, Corvo goes on a ravenous quest for revenge while he attempts to rescue Emily and return her to her rightful place on the throne. To go along with your sword, you’ve also got a crossbow, pistol and various other weapons (grenades etc). But the most satisfying way to play through Dishonored is by being stealthy. As fun as it is to drop down on someone and impale them through the chest, sneaking through an area with everyone being none the wiser, just makes you feel like a true assassin. “I’d say I was being punished, but I know that the world doesn’t punish wicked people. We make our choices and take what comes and the rest is void. I can’t say I wasn’t warned.” – Daud. This brings us to the last piece of DLC for Dishonored: The Brigmore Witches. This piece of DLC finishes the side-story started in the previous DLC: The Knife of Dunwall, which put you behind the mask of master assassin Daud. As you’ll learn while playing through the main campaign, Daud was the assassin who murdered Empress Jessamine. 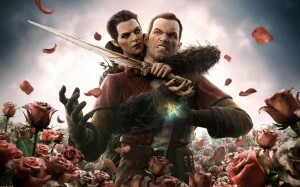 The two Daud-centered pieces of DLC focus on his quest for redemption for his acts during the main campaign. The torment and regret that you experience as Daud really drives home the DLC for big fans of the game. I think one of my biggest complaints of this DLC was that most of the level designs seemed to lack the intricacies of the main campaign. Levels seemed more streamlined than they needed to be and didn’t leave as much open for exploration, which was one of the biggest joys of the main story. You’ve still got some buildings you’re able to scale, but it doesn’t seem as detailed as it could’ve been. One of the biggest perks of the game was the addition of a new power for Daud: Pull. This ability (at level 1) allows you to pull items from across the room such as keys, ammo and important items. At level 2 you’re able to pull enemies to you and give yourself the option to stealthily KO or kill them. Overall, the story of The Brigmore Witches wraps up nicely and is a decent swan song to one of the best games of this console generation. But, for me at least, it felt a bit underwhelming given the lead up to your epic showdown with Deliliah. The Brigmore Witches, while feeling generally satisfying, felt a little more “safe” than I was hoping for my last trip to Dunwall. The Brigmore Witches is out now on Xbox 360, Playstation 3 and PC. + Daud's new power "Pull" is a lot of fun. + Any time spent in Dunwall is a good time. - Stories conclusion felt a bit too safe. - Lacked a lot of the open-world feel that made the main campaign so immersive.